Media captionA British man has told the BBC how he swam over four miles to safety after being "followed" by a tiger shark. A British diver says he swam 7.5km (4.5 miles) to safety off the coast of Australia after losing sight of his boat and being "followed" by a shark. John Craig, 34, had been spear-fishing underwater in Western Australia on Friday when he surfaced and could not see the boat, being crewed by a friend. Mr Craig said he noticed a shark as he called and splashed for help. He then began a long swim back to shore before reaching land and walking for another 30 minutes until he was seen. The Sunderland man, an experienced diver who moved to Australia two years ago, said the shark had appeared to be a tiger shark about 4m in length. "It was extremely close and curious and kept approaching me from different angles. It was trying to work out what I was and whether I could be on the menu," he told the BBC. "It was terrifying. I thought I was just going to be eaten out here in the middle of nowhere... this shark is just not leaving me alone." Mr Craig said he placed his spear gun between himself and the shark as it swam around him in Shark Bay, about 800km north of Perth, the state capital. He then decided to swim towards the Francois Perron National Park after spotting a red cliff "very low on the horizon". But Mr Craig said he was followed by the "curious" shark for about 15 minutes. "At this point I thought I was gone - 4 nautical miles out to sea with a huge tiger shark following me - I thought this was it, this is how I am going to die," he said. "I would look back and see its head come out of the gloom and at my fins, keeping pace with me." He said he felt almost like the shark was "escorting" him to shore, but after a time it disappeared. Mr Craig estimated he swam for another three hours before reaching land, where he noticed an air and sea rescue effort was under way. Unable to gain anyone's attention, Mr Craig began walking towards a campsite until a plane spotted him about 30 minutes later. 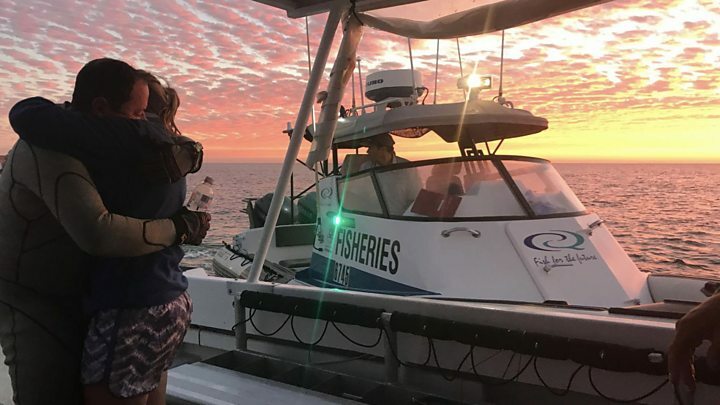 "I could not believe that someone could swim that far in such a short period of time," said Glen Ridgley, from Shark Bay Volunteer Marine Rescue. "I guess where there's a shark besides you spurring you on... it's like a trainer." Mr Craig was reunited with his wife aboard one of the rescue boats. He has praised the quick response of the area's search and rescue authorities. His original boat had experienced mechanical issues but his friend was OK, Mr Craig said. Tiger sharks are responsible for the second-highest number of reported attacks on humans, according to the International Shark Attack File.